Arriving in Shanghai was impressive. It had the best railway station we have seen so far. The city felt modern, cosmopolitan, all those things Beijing was expected to be. 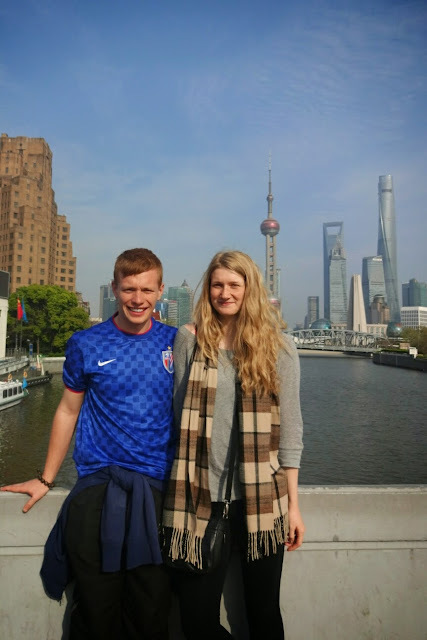 As soon as we arrived in the city we headed to the Bund. The famous river that is situated in the middle of the city. This is where we found the most impressive man-made skyline in China. The originality and scope of the buildings in the financial district was breath taking, and something I have been waiting for since arriving in China. Walking around Shanghai, I instantly noticed it was very different to places we had been already. The roads are crazy - all online reviews for Beijing warn you to be careful on the roads, or you will be hit. I didn't feel unsafe on a single road there. Within 2 hours of arriving in Shanghai I has almost been hit twice! It feels like Shanghai is Beijing's baby brother - doesn't follow the rules and is very wildly. When looking for food, I realised that Shanghai would be very hard to find vegetarian food. Even the spring rolls (that I have been waiting for since landing in Asia) are meat only, our tour guide doesn't even believe they do vegetarian ones! Outside many of the restaurants on the side streets are containers storing some dead and some alive fish. Matt walked down one alley where there were turtles and frogs jumping around, waiting for the slaughter. We haven't seen much of this in China, and it certainly wasn't something I expected in Shanghai. 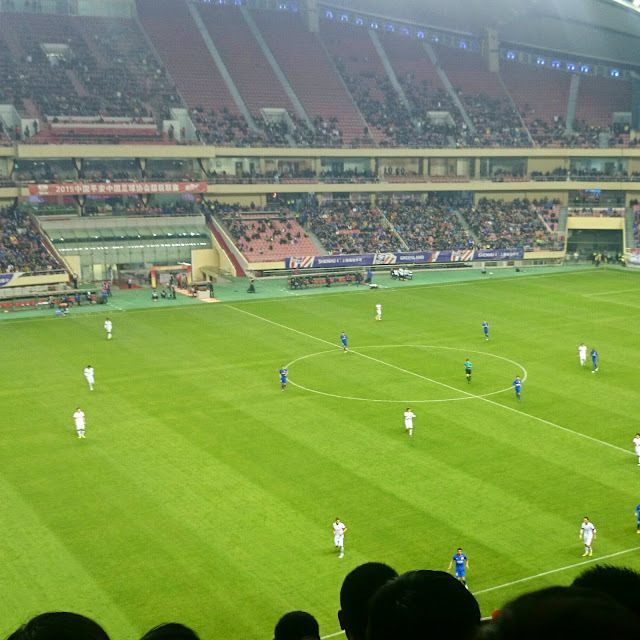 In the evening we attended a Shanghai football match - Shanghai Shanhua. 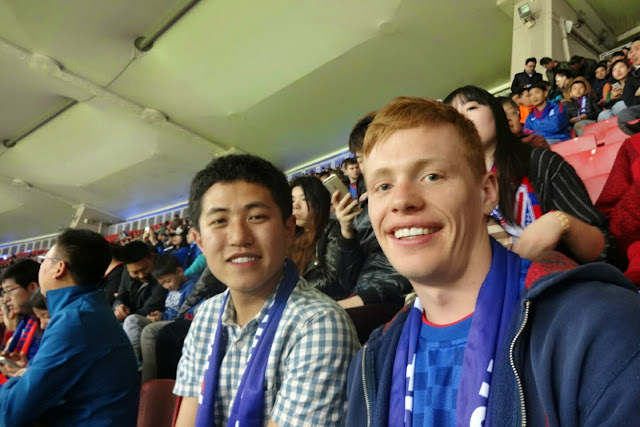 Although the crowd were shouting in Chinese and the football was League 1 standard at best, it didn't feel any different from being in England - perhaps football is the world wide sport? Unfortunately, Shanghai didn't win (much to the annoyance of our tour guide, Jim) but the experience was very exciting! The next day was very busy with our Formula One day (which led to an early night in bed!). Waking up on Monday, I felt a lot more rested (after 13 hours of sleep)! 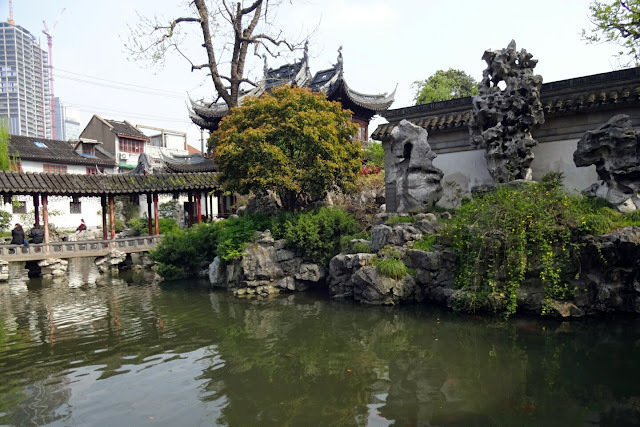 We walked to the bus station to catch a bus to one of the four ancient water towns of Shanghai - Zhujiajiao. Our tour guide (who isn't our tour guide anymore), Jim, recommended we go and said it was near where he actually lives in Shanghai. We climbed on the bus and after a few minutes it began to move. We were hoping that they would make us pay before it began to move so we could check where we were on the correct bus! Thankfully it was and after an hour we arrived. The weather in this small town was crazy different to Shanghai, the wind was so strong and it looked like it was about to start raining - not expected. So we ran to the closest restaurant for food! Once again, the menu wasn't in English, so we had our usual fun of guessing vegetarian food! When we finally made it to the water town it was really pretty. Little commercial shops lined small alleyways, offering silk and jewels. Cafes advertised English food and hot chocolate on the river. 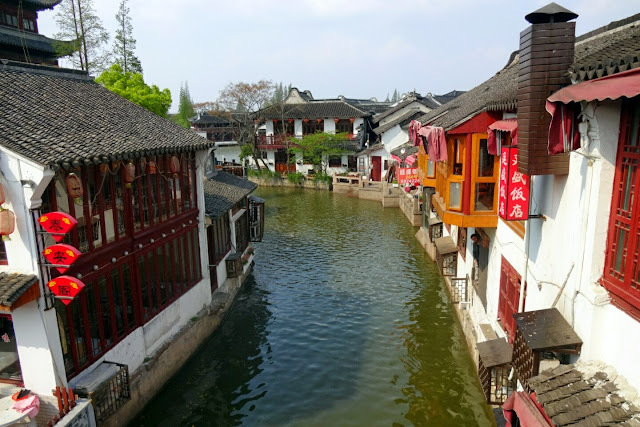 The town describes itself as the Venice Of Asia and in terms of its snaking streets, it's correct! We ran into our first proper chocolate shop and obviously had to buy some. Chocolate in China is a rare thing, they only seem to eat snickers or M&M's, so this was a very pleasant surprise. In the evening we went to the Shanghai World Financial Centre. This impressive building has the worlds highest viewing platform. Obviously we weren't going to pay for that, so we went to the hotel bar 7 floors below. The view was spectacular, we could still see the tops of the huge skyscrapers around us and we could see over the rest of Shanghai. This view was undoubtedly better than any of the others we have seen so far. Additionally, the hotel was very nice and had some form of VPN on their Internet network, allowing us to access Facebook and Instagram properly for the first time in China! 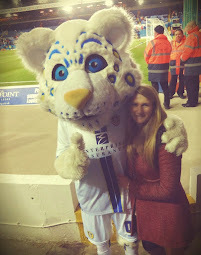 I woke up the next day quite early to ensure I wished a very special someone Happy Birthday - Happy Birthday Amy Hadley, hope you have had an amazing 23rd Birthday! Unfortunately at this end it was raining, not the birthday start which was expected. We changed our plans to help us stay dry and warm - going to the Shanghai Planning Museum. The Planning Museum outlines the plans for Shanghai until 2020, to become a bigger and more modern city. The reason we went is because it houses a to scale model of all the buildings in Shanghai - from the financial district to the residential areas. Although the model made the city look impressive, it was definitely more appealing to Matthew than it was to me! In the afternoon we went to the Yuyuan district. This area was really beautiful. All of the shops were housed inside traditional Chinese buildings made of wood. The whole area was so busy that very few cars went down the roads due to pedestrians in the streets. 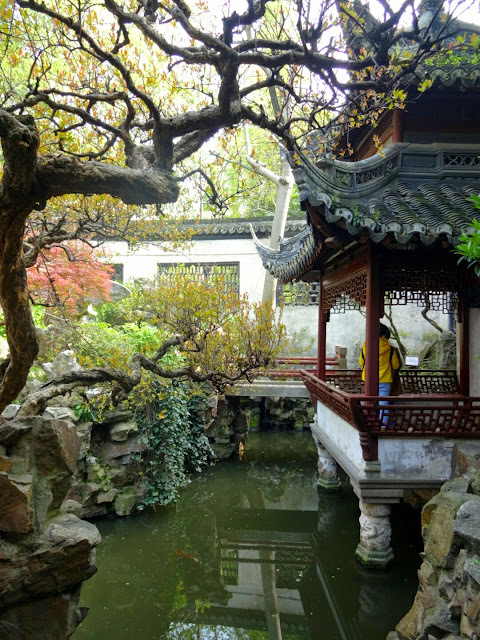 We headed into the Yuyuan Garden which was built in the Ming and Qing Dynasty and are still preserved today. 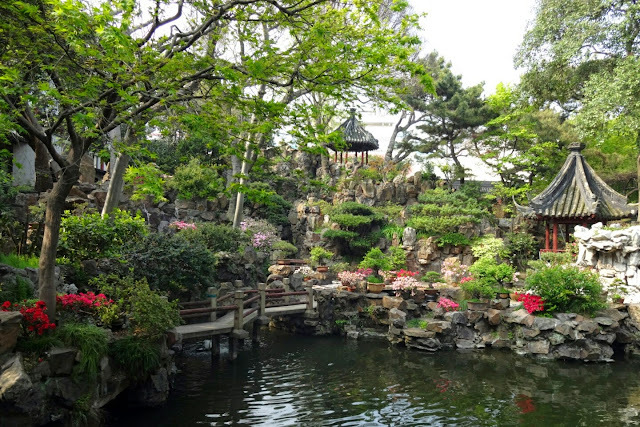 The gardens were some of the most impressive I had seen in China. The amount of open space and ponds was really nice to witness and very different to most of Shanghai! Outside the Gardens was a Taoist temple. It resembled many of the Buddhist temples we have seen and I am not too sure of the differences between them. 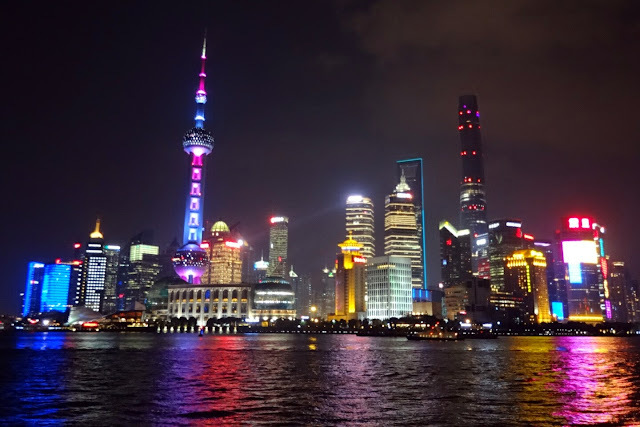 The more time I spend in Shanghai, the easier it is to see its beauty. However, there is still something about this city which doesn't call to me the way Xi'an or Beijing did. In the evening we had our last Chinese meal - eggplant (aubergine) and rice, obviously. Then went back to the hostel to pack for Korea!